Advanced Breast Cancer Part 1: You need not have to die! Advanced Breast Cancer Part 2: To die or to heal is your choice. Paula Black is a wife and mother, businesswoman and co-pastor of a church. She and her husband Dale, helped build churches in several countries and established an orphanage in Guatamala. One day, Paula was diagnosed with breast cancer. The doctor gave her 3 to 6 months to live. 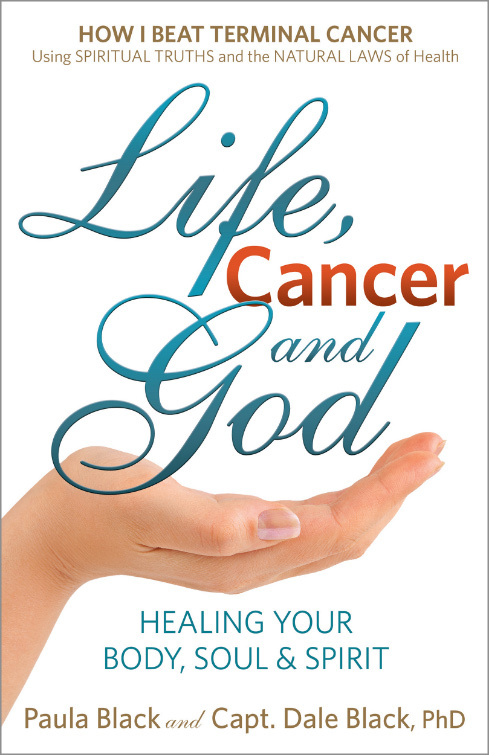 Paula shared her healing story in this book, Life, Cancer and God. What did Paula do after being given this “death sentence” by her doctor? With my husband Dale’s help, I began researching everything I could about my fatal disease. Eventually, I …found a combination of methods that treated the root causes of my disease, not just the symptoms. Against my doctor’s advice, I followed my own newly discovered path, which I call the Body-Soul-Spirit approach. I got well. What I learned and acted on saved my life. I made a promise … I am now done with the medical system in my battle with cancer. I will not be back (to the hospital again). There is nothing more they can offer me that I want. Even if I get sicker and look like I’m getting real close to losing this battle, I’m not coming back. Through thick and thin, I’m committed to following the plan God had given me – my Body-Soul-Spirit approach. What made Paula so sure and so strong? Strong faith in her God. If God has allowed cancer in your life, He’ll use it for your good and His glory … if you do things His ways. Faith doesn’t come by praying for it. Instead, faith comes by knowing and trusting in God’s word. Did Paula get well immediately? NO. Her healing took time. My self-discipline had never been stronger but my symptoms continued to get worse, NOT better. The lump on my arm grew larger. The pain in my abdomen got more severe – some days I couldn’t walk at all. Day after day my faith was put to the test by circumstances and symptoms of deterioration. Every twinge of pain invited FEAR — relentless fear that hounded me like a hunting dog following a scent. Did Paula made a mistake to follow a “wrong and unproven” path? Most people would surely say YES ! She was getting worse, not better. Most people would have “chickened” out. But Paula eventually won her battle! It took about 8 months of rigorously following my lifestyle regimen for my body to respond … Eventually I could tell that my immune system was getting stronger – little by little. Step by step. My energy began to increase … the lump on my arm began to melt away. It took longer for the pain in my abdomen to subside, but after a few months, it too … gradually diminished until it was gone. It took about 15 months to really feel good again. I looked good too — healthy and vibrant. I was not the same person I had been when my journey started. What did Paula’s doctor said about her healing? Dr. Anderson (surgeon) gave this standard answer which some of our CA Care patients often hear from their “kind, open-minded-enough” doctors. I’m happy to report that you are completely clear of cancer. There is no sign of any abnormality. Congratulations … you are cancer free. I am not sure what to actually make of all this. I’m not sure what you did. I know you refused chemotherapy and radiation treatments. You may have found another doctor. But whatever you did, you obviously did the right thing. This entry was posted in Breast Cancer and tagged breast cancer by CA Care. Bookmark the permalink.